Moldavite is a wonderful ally for anyone wanting to accelerate their personal spiritual evolution. There really are no other crystals quite like moldavite. 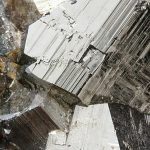 It's vibration is unique in that it almost magically fuses the crystalline energy of the earth with higher extraterrestrial energies of the cosmos. 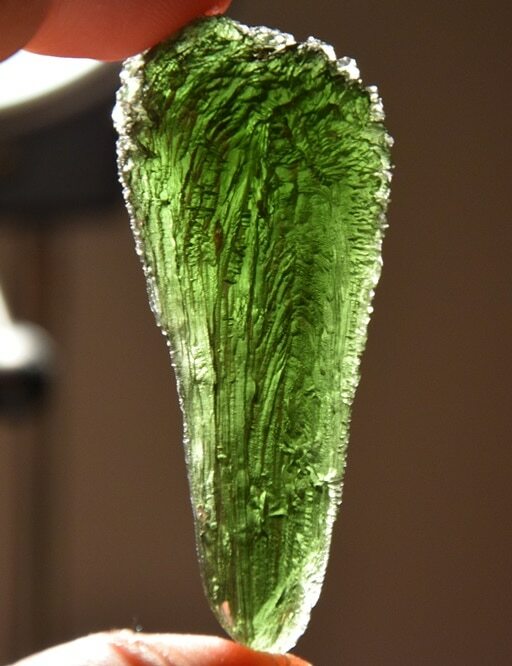 Well, other than the fact that I've rarely met a crystal I didn't love… Moldavite just has a special vibe about it, and by special vibe I mean an incredibly strong frequency with a unique and otherworldly feel to it. 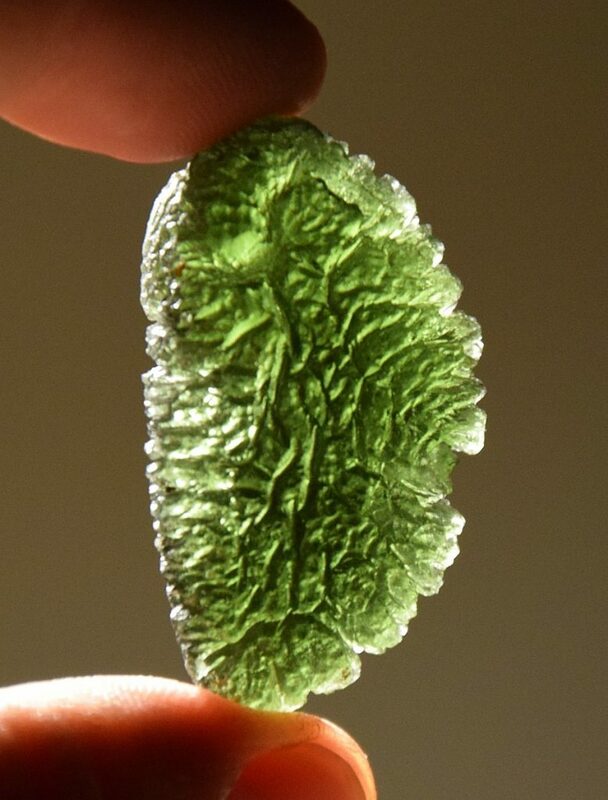 Moldavite is a rare stone of cosmic origin. Moldavites crystal composition broadcasts an incredible energy with the profound ability to accelerate spiritual evolution and hold the space for incredible transformation. Needless to say, this makes it popular stone in the metaphysical community. Everyone reacts to Moldavite a bit differently though, and its energy can hit you differently depending on your present circumstances. For some people, this means having quite dramatic experiences connecting with Moldavites energy. The Moldavite Flush. Holding a piece of Moldavite in your left hand (receiving hand) can bring about a sensation of warmth and a strong woosh like energy sensation that starts in your hand, and then flows into your body and heart center. People sometimes call this “the moldavite flush”. And for people who are sensitive or who strongly resonate with moldavite’s power, this sensation can be intense. For some the feeling is amazing, and for others, it makes them want to drop the stone and run the other way. The simple truth here is that the vibe of Moldavite is so strong that even people who routinely report they feel no effects from stones, will often comment that they can feel something when holding Moldavite. Honestly, you don’t even need to hold a piece to feel its energy and just being in the same room can have a powerful effect! Holding a piece of Moldavite (or wearing it as jewelry) may trigger a heart chakra activation. This activation is typically characterized by a strong up-welling of emotion, unique sensation in the heart center, or just feeling warm or flushed with heat. When Moldavite goes to work in helping to open someone's heart, it may bring about a strong emotional release through tears, laughter, feeling intense emotion, or just getting the sense that blockages are being lifted out of the body. Depending on where you are (emotionally and spiritually) and your present circumstances this could feel liberating, magical, or exhilarating … Or you might just feel really emotional. It really depends. Moldavite doesn't only support the heart center. It also has the incredible ability to activate and open any or all of the chakras. Usually Moldavite will begin working in the areas where you have the deepest blockages and the most stored density. Moldavite seeks transformation, and goes to work on clearing and releasing the most painful past traumas, and shines a bright light towards where you are most in need of healing. Some people are immediately turned off by Moldavite… Because it dives right into your deepest wounds and enthusiastically say’s; “hey lets start here!” which isn’t always the most enjoyable experience, but of course well worth the effort. A common complaint or observation from people new to working with moldavite is that it makes them feel ungrounded, or a bit spacey… To which I smile and nod. This is a byproduct of Moldavites frequency working to uplift, balance, and attune your energy to the higher realms. It absolutely can make you feel a bit spacey or even tired until you become accustomed to its energy. Because of its strong frequency and consistent energy seeking to raise your vibration and accelerate your evolution… Wearing or even holding Moldavite can take some getting used to. I’ve definitely had this experience of holding moldavite in my hand and almost immediately feeling a strong sensation of tingling, light and heat quickly expanding through my body and right into my heart. When I first got a moldavite pendant years ago, I could only wear it for a couple of hours at first before I felt like I needed to take it off because of the intensity of its energy. If you aren’t used to such strong energy, your own energy will try to keep up with Moldavite’s high frequency, which can leave you feeling tired. If this is your moldavite experience, take a break, set your stone down and come back to it later. Because of its truly transformational properties, moldavite is an excellent stone for meditation, energy healing or dreamwork. If you feel drawn to Moldavite but find it to be a bit too intense vibrationally, start small holding the stone for a few minutes at a time and know that you will become more accustomed and attuned to its beautiful supportive and healing energy. As an Angelic Crystal, Moldavite is serving on a planetary scale in anchoring the higher dimensions of light into the physical for both humanity and Earth’s evolution and healing. Where Does Moldavite Come From? 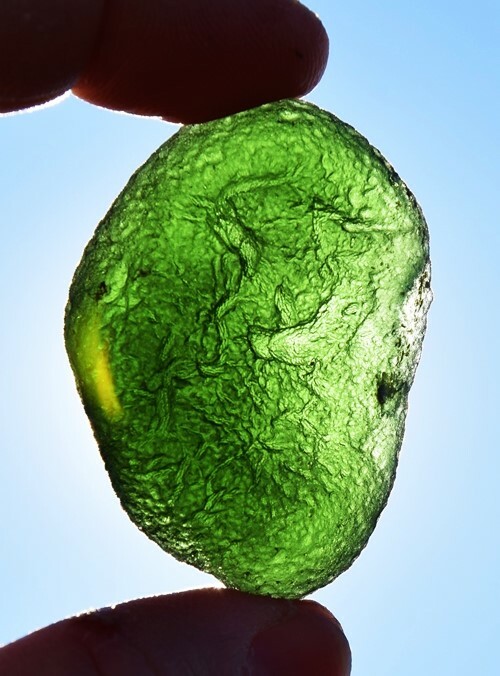 Moldavite is what’s known as a tektite stone. A somewhat mysterious group of objects, almost glassy in appearance, which are said to be the products of a meteor collision 15 million years ago. The crater created by the impact is known as the Reis crater in the Moldau River Valley in the Czech Republic. Because there was only one meteor and one impact, Moldavite stones are found only in Czech Republic and are considered exceptionally rare. They are usually aerodynamic in shape, leading some scientists to speculate that Moldavite fell from space after the collision – making them truly gemstones with a cosmic or extraterrestrial origin. Thanks to their rarity, these emerald like stones have been passed among royalty as gifts and have been associated with the legend of the Holy Grail. It’s easy to feel their power and their healing powers have long been connected to spiritual evolution. According to Czech folklore, moldavite brings harmony to marriages… Which honestly makes sense as it supports the healing and growth of both individuals. How to Spot a Fake Moldavite!? Genuine Moldavite is an incredible stone… But because it is a very rare stone, and becoming increasingly expensive, an unfortunate byproduct is that the market has become flooded with fakes. If you’re energetically sensitive, tuning into stones before buying them can allow you to discern whether a stone is real or not. 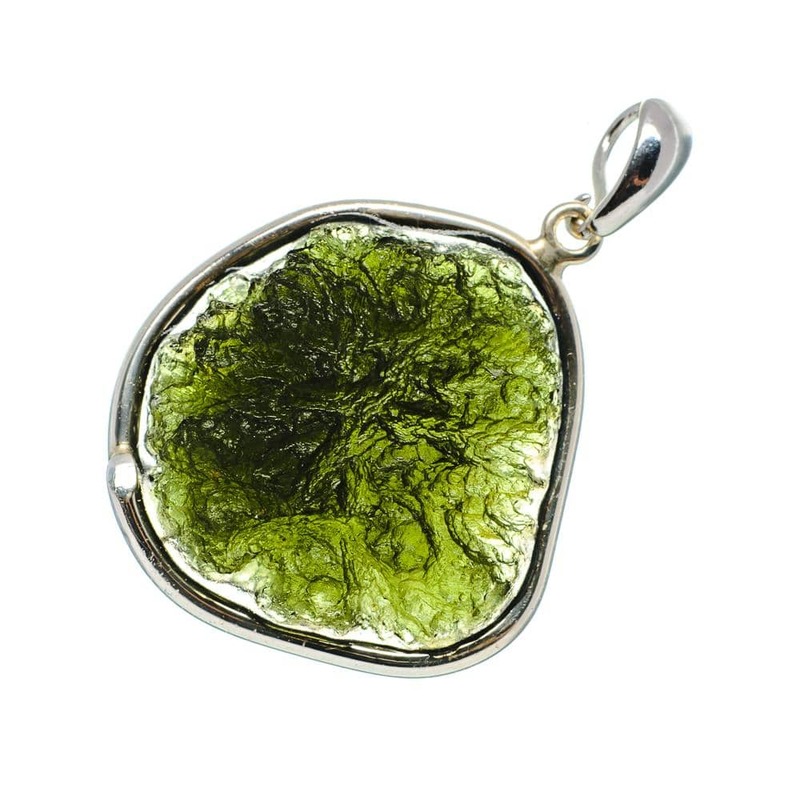 Do you feel the rush of energy Moldavite brings? 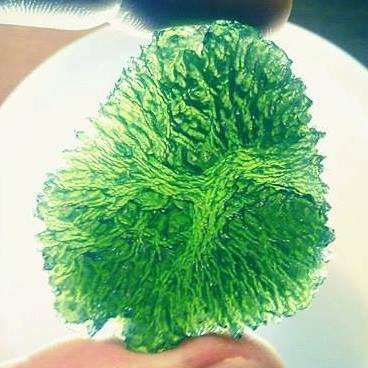 Visually Spotting Fake Moldavite today can be tricky though as many of the counterfeiters are becoming increasingly skilled at creating realistic looking, but completely fake Moldavite. Beware of inexpensive large pieces, green glass looking “Moldavite Beads”, or unknown and largely anonymous sellers online or at gem shows. Because Moldavite is such a valuable stone if you are going to purchase some, it's important to educate yourself as to what you're looking for, or purchase from reputable dealers selling genuine Moldavite from the Czech Republic. The good news is there are tons of great sources both online and in person. Read reviews, educate yourself, and keep in mind that if you find an amazing deal on a large piece of Moldavite that seems “Too good to be true”… It probably is just that. For Moldavite Jewelry, I do have a reputable source I can recommend! I personally love shopping online at Ana Silver Co… They have a great selection of Czech Moldavite Jewelry set in beautiful sterling silver. I also appreciate how for example, they'll leave the back of a Moldavite Ring open so that the energy of the Moldavite is not blocked off from your skin by silver. Still not sure if Moldavite Is For You? Moldavite is sometimes known as the Emerald Gem of the Galactic Heart, it truly has transformative qualities that will resonate throughout your being assist in your personal and spiritual evolution and increasing your vibration. Assists the ascension of the heart center. If Moldavite is calling to you, you’ll find it to be a wonderful partner on your spiritual path. I can’t help but agree… But I am certainly glad I don’t have to narrow my crystal allies down to only one choice!